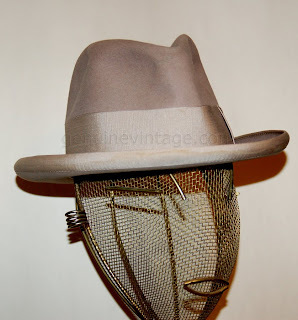 The Homburg style hat began as jaunty Austrian casual sporting headwear, the kind of thing one wore, oh, let's say, with a shooting outfit, and made its way to England with the jaunty Prince Berty. By the middle of the 20th century, sporty no more; now much more formal and what many men might wear with an overcoat covering black tie. 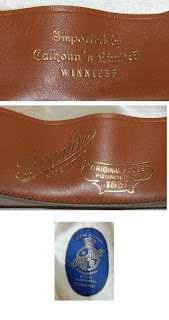 Lately it's been showing up in collections in a greater range of colour and back to its roots as a sporty hat. 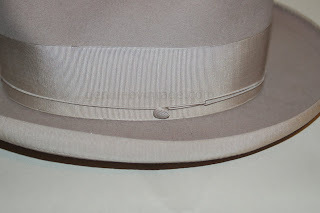 This superb example is from the preeminent Italian house of Borsalino and features expensive options: grosgrain brim edging as well as the little elastic & button thingy which on windy days allows for looping to a coat button to keep your hat attached in case of a sudden gust attack. Nothing so unseemly as having to chase your expensive hat down the street and then having to stand helplessly by, wearing only a shocked and saddened expression, as you witness its demise under the wheels of a bus. You do know of the Fedora Lounge? You're welcome, for this newest rabbit hole!